UPDATE: All six closed stations will reopen at the start of service on the morning of Sunday, Jan. 20. Service will be maintained with free bus shuttles in place of Green Line train service between Crenshaw Station and Redondo Beach stations during the closure. Bus shuttles will stop at all stations and run as frequently as the Green Line. Metro staff will be on hand to lend assistance at all Green Line stations where bus shuttles are running. For those planning to travel to LAX Airport during this period, the LAX Shuttle G bus will operate from its usual stop at Aviation/LAX Station. Other transit options to LAX include Metro Lines 102, 111, 117, or 232. Ride to LAX City Bus Center (also served by Beach Cities Transit 109, Torrance Transit 8, Culver City 6 / R6 and Big Blue Bus 3/ R3). Upon arrival at the LAX City Bus Center, transfer to the free LAX Shuttle which serves all airline terminals. 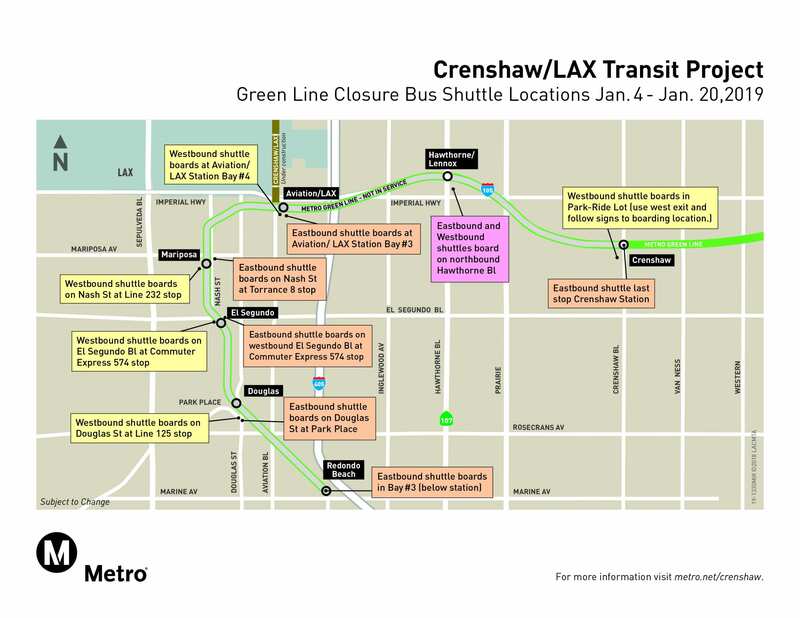 Additionally, Big Blue Bus will operate a free shuttle with direct service between Crenshaw Station and Aviation/LAX Station beginning Monday, Jan. 7 through Friday, Jan. 18. The shuttles are slated to run every 15 minutes on weekedays only, from 6 a.m. to 9 a.m. and 3 p.m. to 7 p.m. Learn more here. After the work is complete, crews will be able to activate the rail connection between the Crenshaw/LAX Line and the Green Line to make them functional and begin testing service operations. Thank you for your patience as we continue to move towards the completion of the Crenshaw/LAX Line in 2020. We know growing pains can be tough, but in the end we’ll have a bigger, more connected system. If the track is shut down how are they going to get the trains from the rail yard to east of LAX? Based on last closure, they leave the trains at the end of the Norwalk Station tracks. Wasn’t part of the Green line shut down for about 40 days earlier for just the same thing? That is correct, but there is some additional work that needs to be completed that requires this closure. Was this additional work unexpected? What is the reason for another closure rather than having completed all work the first time around? During the shutdown, why not extend the shorter platforms to 3 car platforms? Just do it. I catch the green line from harbor fwy, to get to lax will that affect my commute as well? Hi Carlos—under this plan your ride should be the same. The train would also continue to the new station at Century & Aviation being built as part of the Crenshaw project. Y’all need to do a better job of conveying this. Just like last time, there wasn’t enough advance notice in the right places. I don’t see signs on the trains nor do I see signs on the platforms or at the turnstiles. And I haven’t seen anything on Twitter or the news either. I only happened to hear about it because of another rider on the train just now. The bus ride is severely inconvenient… how about compensating riders for the inconvenience? Last time it added at least 20 minutes to the ride. Quicker to just bite the bullet and drive in on the 105. Perhaps by a temporarily lower fare? Also, there is a concern since some of the stations in the closed area charge for parking and require TAP validation. How will that be addressed?